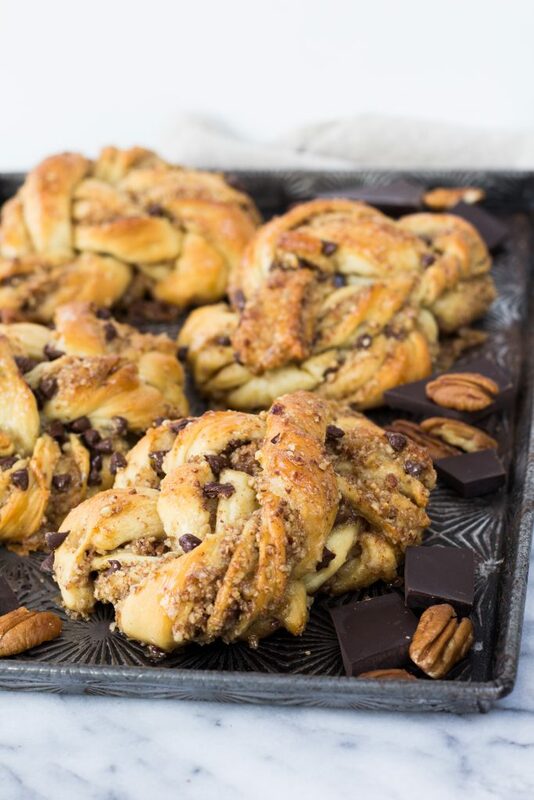 Chocolate pecan pie is a favorite and so are cinnamon knots, so why not combine a beloved pie flavor with some buttery, pillowy-soft pastry? And ta-da these Chocolate Pecan Maple Knots were created. I’m gonna be real here: putting these Chocolate Pecan Maple Knots together is NOT complicated, but you need to pay attention. There’s some rolling, measuring (yes, I used a ruler), cutting, and twisting involved. Thankfully the uber-talented Thida Bevington, home-baker extraordinaire and all-around brilliant single mom, shows you exactly how to get it done. Follow her on Instagram and check out her IG Story Highlights for Babka Knots. I used that exact tutorial to form these Chocolate Pecan Maple Knots. 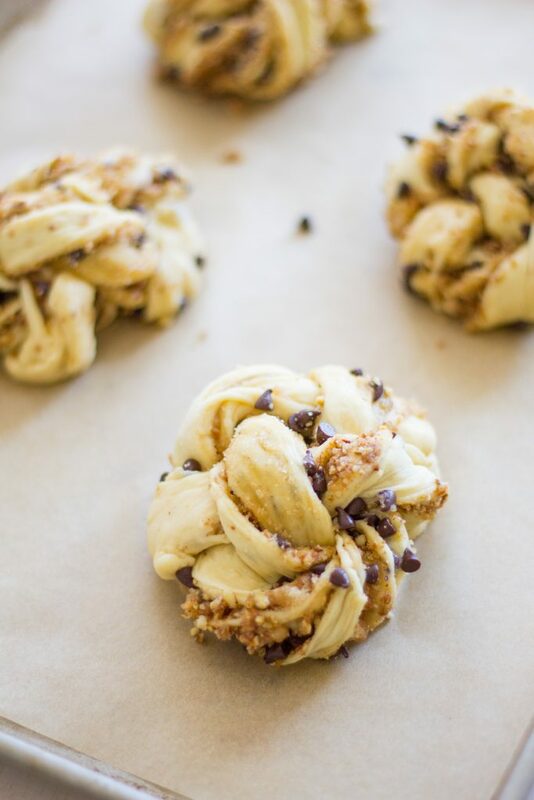 The process of forming these Chocolate Pecan Maple Knots can get a little messy because the sweet, salty, crunchy filling has the tendency to spill out of the dough as you form the knots. Don’t worry though. Gather all of the extra filling scattered across your work surface, and save it to top muffins or a loaf of quick bread. I used the extra pecan and chocolate filling from my Chocolate Pecan Maple Knots as a topping for a loaf of banana bread. It gave my humble, but still scrumptious, banana bread some extra texture and flavor. 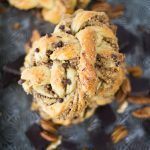 When you read the recipe, you’ll notice that I the pecan filling is made with chopped pecans mixed with sugar, salt, vanilla, and a bit of butter. This sandy, wet mixture helps the pecans remain sandwiched between the layers of buttery dough as they are being twisted and knotted. 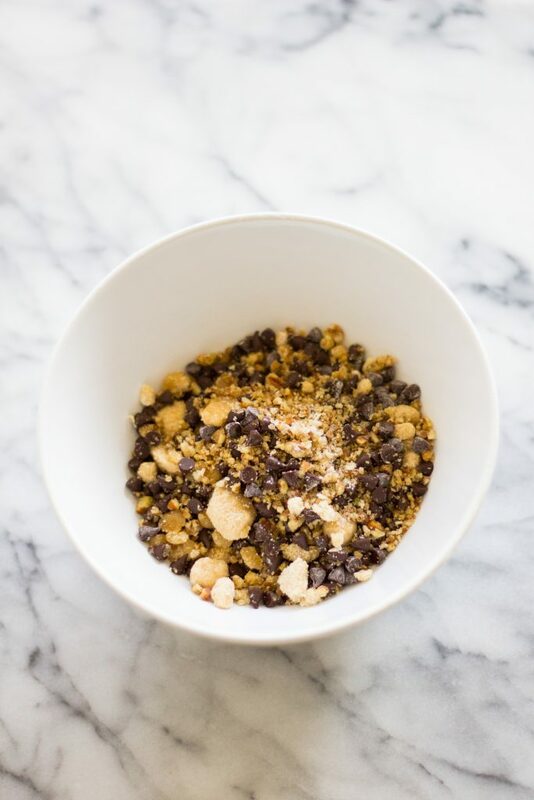 Plus, the added ingredients help highlight the flavor of the pecans. 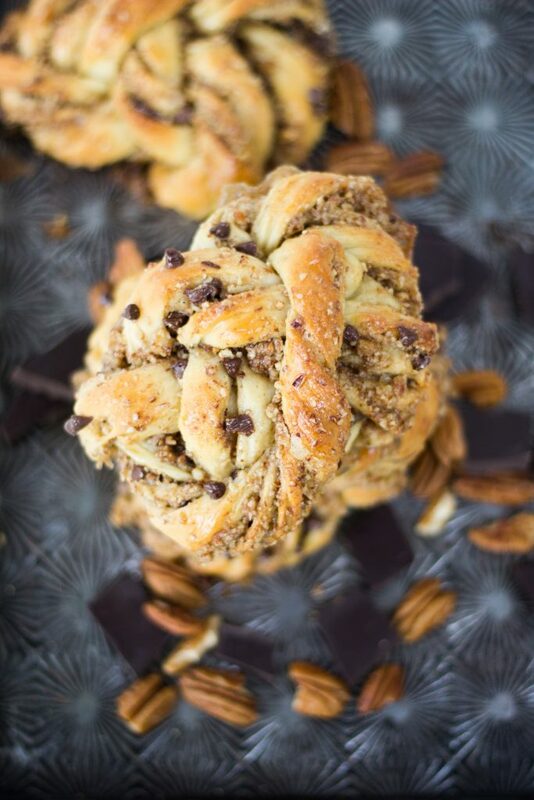 The dough I used for these Chocolate Pecan Maple Knots isn’t sweet on its own. And the filling itself isn’t too sweet either. So to add a little extra sweetness, I brushed the warm knots with warm maple syrup. The syrup adds a pure maple flavor, some extra needed sweetness, and a gorgeous, shiny finish. If you’re tempted to skip the maple syrup, do NOT do it. It takes a few extra seconds (and maybe creates an extra dish or two to wash), but it’s so worth it! I got these Chocolate Pecan Maple Knots out of my house ASAP. Sweets like this always result in a positive correlation: the longer they’re in my kitchen the more I eat. So, like any compulsive baker who wants to stay healthy, I packaged these suckers up and gifted them to friends. Let’s just say one friend who received two of these knots texted me the following: “I’m not sure what these are, but I already ate one entire knot.” And another friend said, “These are in the hall of fame of your desserts. ” Well, thats some positive feedback. 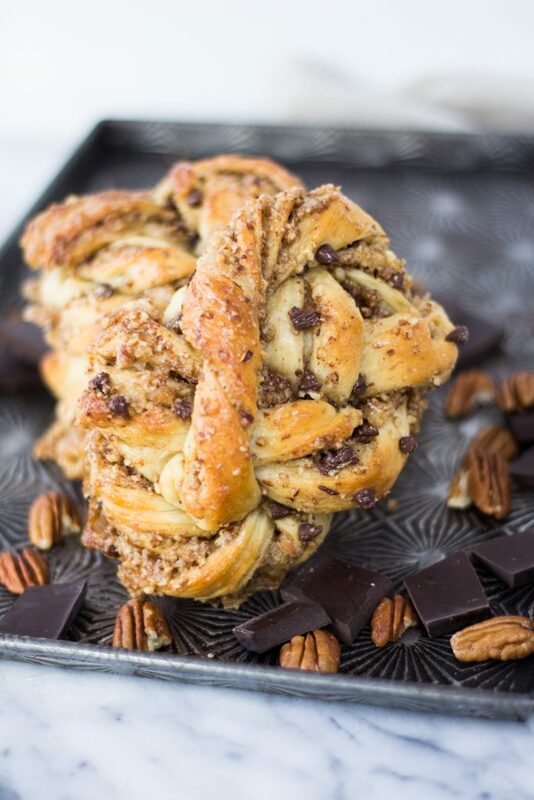 I’ll take it, and it’s a sure sign that these Chocolate Pecan Maple Knots are a winner!